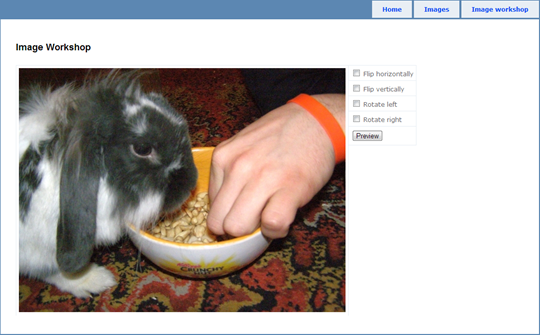 In my previous posting about WebImage helper I introduced how to use WebImage for different image manipulations. In this posting I will show you how to build simple online image editor using WebImage helper. You can find source code of this example from Visual Studio 2010 experiments repository at GitHub. Simple image editor belongs to Experiments.AspNetMvc3NewFeatures solution, project name is Experiments.AspNetMvc3NewFeatures.Aspx. Here you can see the screenshot of simple image editor. Four simple operations is enough for current example. <%@ Page Title="Image Worksop" Language="C#" MasterPageFile="~/Views/Shared/Site.Master"
When you take a look at image definition in view you can see that we need two separate actions – one that returns editor view and the other that returns image. I said before that controller is extremely simple. Don’t mind my not so nice solution for image action – it is my working draft.